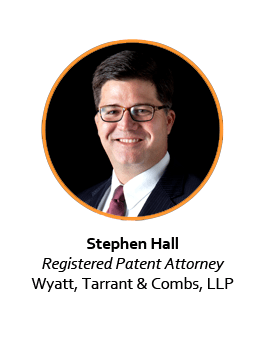 Stephen Hall (Steve) is a Registered Patent Attorney with Wyatt, Tarrant & Combs in Louisville. He helps clients create, protect, and realize value from their patents and other intellectual property, in the areas of medical devices, biotechnology, microelectromechanical systems, software, and chemical inventions. Steve takes an integrated approach in helping clients make decisions and take action based on the big picture. He is recognized by Best Lawyers in Biotechnology Law and by Chambers USA. He is a frequent lecturer and published author.